Australia has a rich history of organised interest in the UFO subject. Various cooperative national ventures were undertaken over the decades, the most notable being the initial publication of the Australian Flying Saucer Review magazine in the early 1960s, the Commonwealth Aerial Phenomena Investigation Organisation (CAPIO) in the mid to late sixties, the Australian Co-ordination Section (ACOS) for the Centre for UFO Studies during the seventies (which became the Australian Centre for UFO Studies in 1980), the UFO Research Australian Newsletter (UFORAN) magazine and the UFO Research Australia in the 1980s and early 1990s, the Australian UFO Research Network since 1998 and the national newsstand magazine Australasian Ufologist from 1999. This article will focus on these national based initiatives which were a force of collective perspectives brought to bear on the UFO phenomenon, which clearly had more than just state based manifestations. Public civilian investigations took off in July, 1952, when in response to a huge wave of sightings at the time, and one of his own, during May, 1951, Edgar Jarrold began Australia's first public civilian flying saucer organization - the Australia Flying Saucer Bureau (AFSB)- based in Sydney. During 1953, the Australian Flying Saucer Investigation Committee (AFSIC) was established in Victoria, and the Australian Flying Saucer Club (AFSC), which later became the Australian Flying Saucer Research Society, began in South Australia. Jarrold’s group had “Australian capital city observers” in Brisbane, Sydney, Melbourne, Adelaide, and Hobart. From each of these state connections lay the seeds that would lead to the ultimate development of strong state groups. With the departure of Jarrold by 1955, and the failure of Fred Stone to develop a similar network, state borders progressively lead to the formation of strong independent groups, which arose from active elements developing in various states. These included the UFO Investigation Centre (UFOIC) during 1956, the Queensland Flying Saucer Research Bureau (QFSRB - now known as UFO Research (Qld)) in 1956, and the Victorian Flying Saucer Research Society (VFSRS - now known as the Victorian UFO Research Society) in 1957. During the fifties cooperative national ventures initially pivoted around the group activities of Edgar Jarrold in NSW, then Fred Stone in South Australia. By the end of the decade there was a national association developed among some of the state groups. This was initially suggested by UFOIC in June 1958, with the idea that such an association would allow the collective membership of all state groups to access pooled resources. The UFO Association of Australia was created by September 1958 with a pooled membership of 300 from the three largest cities of Sydney, Melbourne and Brisbane. It was intended that there would be a pooling of resources such as tape recordings, slides and other material. Fred Stone of the AFSRS, perhaps stung by his failure to establish the AFSRS as a national entity, abstained from the association. In June 1959 Papua New Guinea was still a territory of Australia. 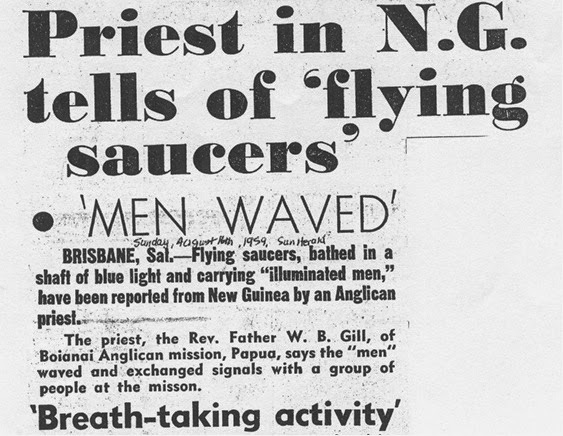 There the spectacular "entity" sightings of Reverend Gill and members of his Boainai mission capture the public imagination and the attention of the Australian researchers. Reverend Gill made notes about the experience and sent a copy of his own report - 8 closely typed foolscap pages - to Rev. Crutwell at Menapi Mission, who in turn sent a copy to Mr. D. H. Judge, a Brisbane member of the Queensland Flying Saucer Research Bureau. The report was released to the media and accounts appeared in the media during mid August, 1959, causing a sensation. Reverend Gill was at the time of his sightings already scheduled to return to Australia. This presented civilian groups with an excellent opportunity to assess the significance of the reports. All investigators found Gill to be very impressive. His credibility was enormous. This lead one of the leading civilian groups, the Victorian Flying Saucer Research Society, to view the Gill reports as constituting the most remarkable testimony of intensive UFO activity ever reported to civilian investigators in the entire history of UFO research. VFSRS indicated that they were unique because for the first time, credible witnesses had reported the presence of humanoid beings associated with UFOs. The VFSRS report concluded that the Boianai UFOs were advanced craft, manned by humanoid beings, capable of a fantastic aerodynamic performance. VFSRS now felt that UFO researchers no longer needed to enquire as to the nature of UFOs, now only their origin was to be determined. Peter Norris, VFSRS president, was advised by the Directorate of Air Force Intelligence that the Department was awaiting "depth of evidence" on the New Guinea sightings. The civilian groups stood at the end of the fifties in a position of strength, unified, strengthened, and galvanised into action, by the quality of the Gill reports. 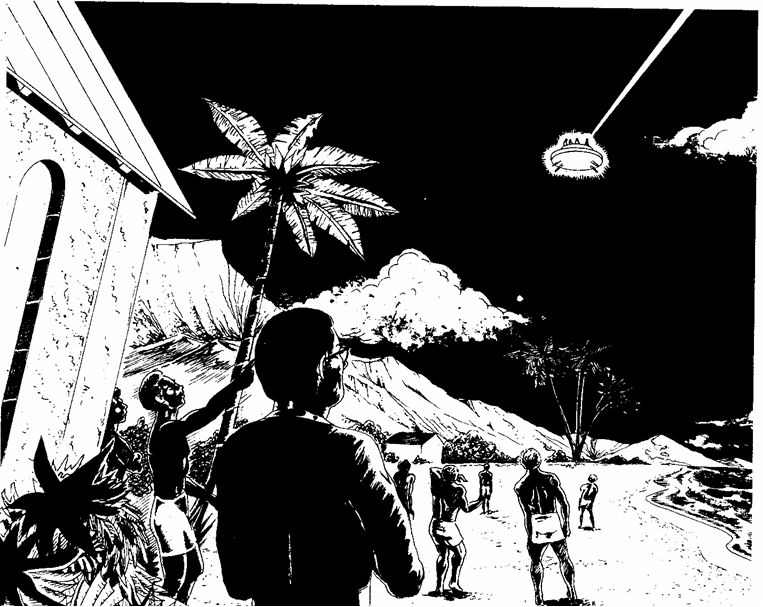 The extraordinary reports of UFO "visitants" over Boianai, Papua New Guinea, during 1959, were remarkable testimony from "credible observers of relatively incredible things" (as the director of USAF intelligence, Major General John Samford referred to the witnesses of the minority of "unknown" and "unidentified" reports, back in 1952). The Anglican Church missionary, Reverend William Gill, provided civilian groups with remarkable testimony of unknown "interlopers". They were in stark contrast to the hoary silliness that punctuated the flirtation of enthusiasts with the contactee absurdities during much of the fifties. Buoyed by substantial data, the civilian groups were ready to face what would prove to be the turbulent sixties. Fred Stone of AFSRS organised the first flying saucer convention in 1960. 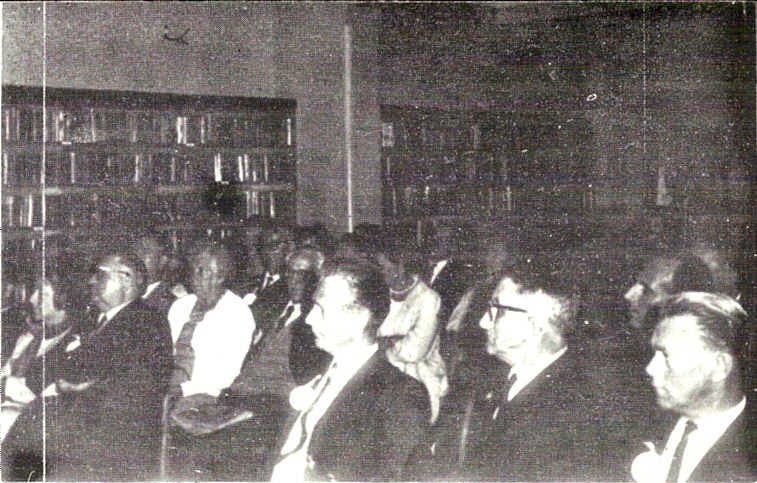 Held in Adelaide it attracted little support from the other states, but the attendance of Reverend Gill gave it some focus, but still it remained anchored in the issues that dominated the fifties – the validity of contactees such as George Adamski, which approach was best – the “nuts and bolts” extraterrestrial approach or the psychic route, and just what were the purposes behind the saucer visitations. During the early sixties some of the state groups even co-operated in a joint publication. But cooperation wilted for a few years. Through to the end of the fifties state groups produced their own publications – UFOIC published the “UFO Bulletin”, VFSRS produced the “UFORUM” journal, and QFSRB issued “Light” magazine. By 1960 in cooperation initially with the Victorian Flying Saucer Research Society (VFSRS) and later also with the Queensland Flying Saucer Research Bureau, UFOIC published the Australian Flying Saucer Review (January 1960, April 1960, September 1960, February 1961, July 1961, January 1962 and November 1962). The interstate cooperative effort lapsed. VFSRS began publishing its own Australian Flying Saucer Review Victorian edition in May 1964, continuing for a number of years, and intermittently after that. 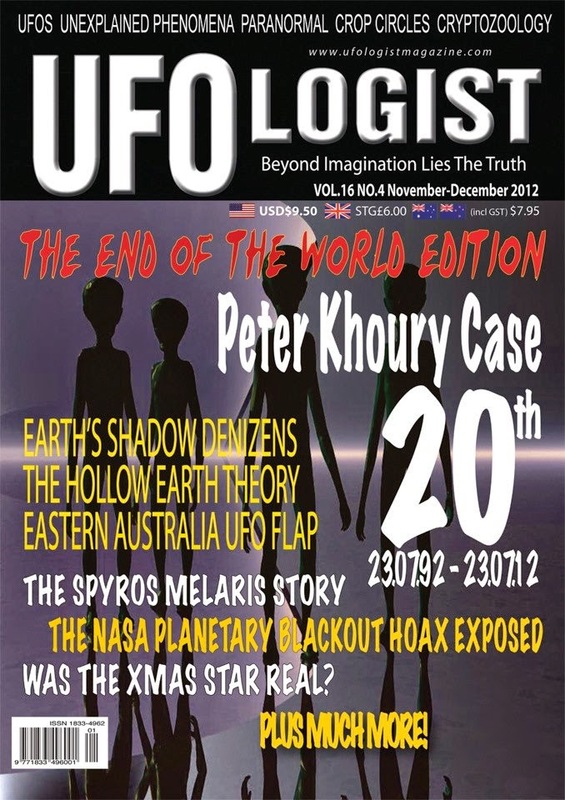 UFOIC published 3 issues of its own NSW edition (June 1965, November 1966 and the much delayed December 1969 issue). By 1965 another national initiative emerged - C.A.P.I.O. (Commonwealth Aerial Phenomena Investigation Organisation) which had some limited success bringing Australian groups together for a few years. A major turning point in civilian UFO research in Australia occurred on February 27th, 1965, at Ballarat, Victoria. What was billed as Australia's real first convention of UFO groups provided a focus for elevating the respectability of the UFO subject. Unfortunately, in hindsight it also started a process that, while initially encouraging, would eventually divide some UFO groups and lay the seeds of group political warfare which would resound for years to come. What seemed to have been a very good idea emerged at the conference. It was suggested apparently by RAAF representatives that the RAAF would deal with civilian UFO organisations only if they were organised on a federal level. It was resolved at the convention to form such a national organisation - "a centralised body all the groups in Australia in order to deal with the government and public on top level." The name of this organisation was agreed as C.A.P.I.O. (Commonweath Aerial Phenomena Investigation Organisation). Officer bearers were elected at the convention. Peter Norris, VFSRS president, was made CAPIO president. Leslie Locke (Western Australia) and Andrew Tomas (NSW) were elected vice presidents. Sylvia Sutton and Judy Magee, both from VFSRS, took the positions of secretary and assistant secretary respectively. This was the beginnings of C.A.P.I.O. Attempts were made for the large state groups to cooperate in combine publications and the national group CAPIO. Both efforts ran into trouble, largely fuelled by group politics. However the 1965 Ballarat convention was a great opportunity for those researchers, investigators and enthusiasts who attended. It had been arranged by W. Howard Sloane, of the Ballarat Astronomical Society, with the aim of removing "the stigma of ridicule from research into UFOs." Not only did representatives of most existing Australian groups attend, but there were also several witnesses to some of Australia's most famous cases, including the Rev. William Gill and Charles Brew, who spoke about their experiences. Former Air Marshall Sir George Jones attended and was out spoken in his support for serious UFO research. The RAAF was represented by Mr. B. G. Roberts, Senior Research Scientist, of the Operational Research Office, Department of Air, Canberra. The presence of a scientific consultant of the RAAF, along with 2 RAAF officers, manning a hardware display, was an unprecedented step for the Australian government. CAPIO lasted a few years but collapsed due a range of problems. Differences again arose and national initiatives were largely abandoned until 1974. The 1960s and the 1970s were periods steeped in UFO accounts of high strangeness that emerged in a climate of gradually increasing maturity in the manner in which the phenomenon was investigated. Considerable intrigue and energetic debate marked the search for answers from both the perspective of the civilian researcher and that of the clandestine world of official investigations. Occasionally such activities came together in curious ways but generally official investigations remained the stuff of secrecy, at least to the general public. Civilian researchers themselves were caught up in fundamental and evolutionary steps towards understanding the nature and extent of the UFO phenomenon. The Australian Centre for UFO Studies (ACUFOS), which started out as ACOS (Australian Co-ordination Section) faired better than CAPIO during the seventies and early eighties. 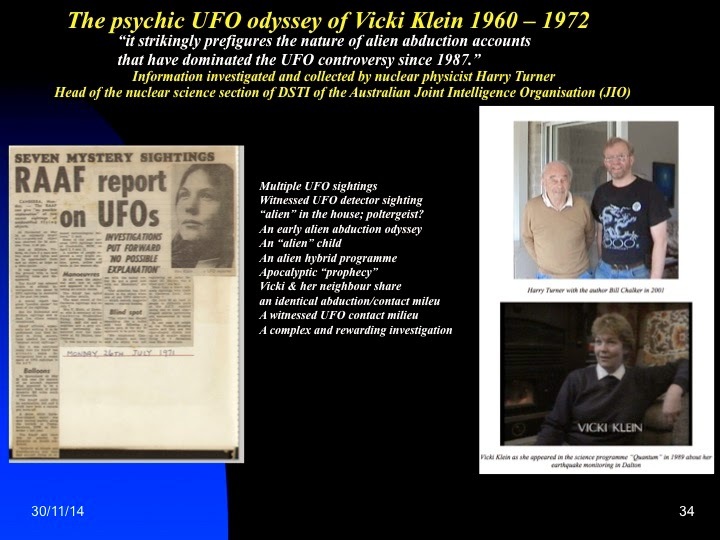 ACOS - the Australian Co-Ordination Section - for Dr. J. Allen Hynek’s Centre for UFO Studies was formed by Harry Griesberg and David Seargent in 1974. ACOS organised regular conferences, the first in 1975, from which a real sense of co-operation emerged between most of the state civilian groups and individual researchers. Both as ACOS and as the Australian Centre for UFO Studies (ACUFOS) from 1980, it was a focus of major projects and documentation programmes. Dr. Allen Hynek, who had acted as astronomy consultant to the United States Air Force UFO study since 1948, came to Australia during 1973, to lecture on astronomy and UFOs and to promote his ground breaking book, "The UFO Experience - A scientific Inquiry", published in the US in 1972. His visit was a watershed for both Australia and himself. Dr. Hynek was in the best position to determine the scientific merits of the UFO phenomenon. He had consulted for more than 20 years with the US Air Force and had moved from a sceptic to a scientist who was willing to actively promote the validity of the phenomenon. He championed the need for serious research. His 1972 book was his case for the scientific merit of the UFO phenomenon. It caused a lot of scientists to rethink their position on the subject. By 1973, Dr. Hynek lacked an appropriate vehicle for his ongoing research. For years he had quietly encouraged and actively participated in the "invisible college". Following his visit and the massive resurgence of UFO activity in America during that year he brought the "invisible college" into the open and formed the Centre for UFO Studies. It continues as an ongoing focus for serious research into the UFO phenomenon. During his stay he researched many of the classic cases. Dr. Hynek was able to meet with Rev. William Gill and also journeyed to Papua, enabling him to undertake a detailed on site investigation into this famous case. He came away still convinced of the bonafide nature of the Boianai "visitants". While in Australia he had discussions with researchers to try to set up a local focal point of case material which could then be forwarded to his group in Chicago. 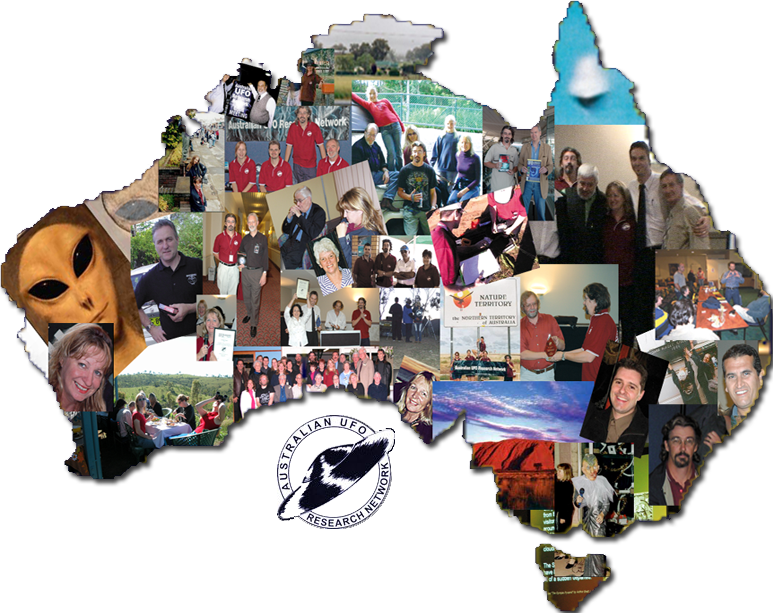 Out of those discussions, ACOS - the Australian Co-Ordination Centre for the Centre for UFO Studies was formed. 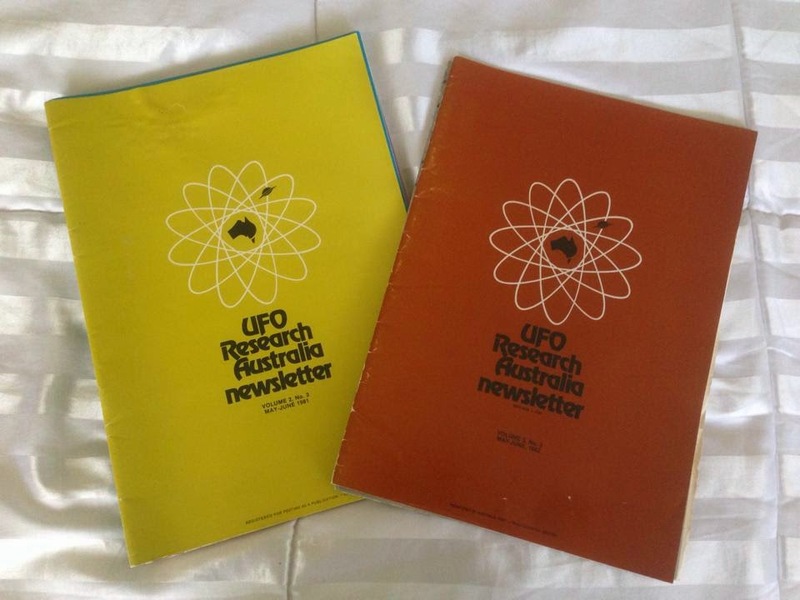 In 1980 a number of the state groups joined forces with the cooperative publishing venture UFO Research Australian Newsletter (UFORAN) edited by South Australian research group veteran Vladimir Godic. It became a focus for cooperative activity often with a national focus. ACUFOS had been successful in its efforts at co-operation at a national level, but by the second half of the eighties it loss much of its momentum, when many of the leading researchers, tired of group politics and problems, opted for a more informal networking structure. In 1984 UFO Research Australia (UFORA) formed by Vladimir and Pony Godic, with Keith Basterfield, was the outgrowth of this trend. It was successful in its efforts to encourage serious research on a loose networking basis. UFORA also pioneered the use of electronic mail and bulletin boards by UFO researchers in Australia. 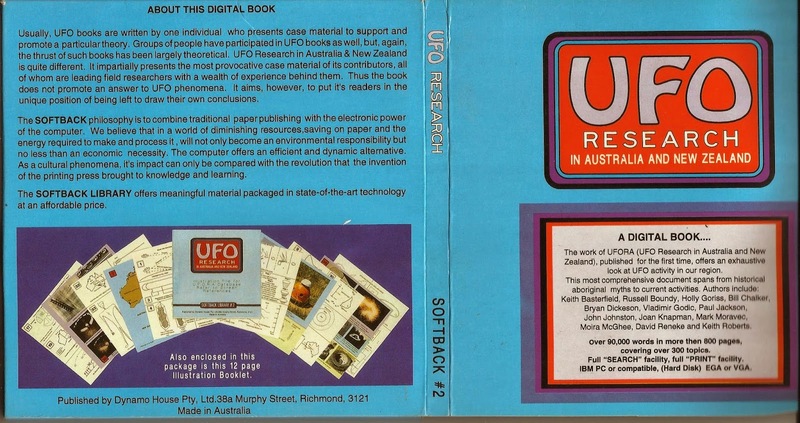 Vladimir and Pony Godic edited a digital book on UFO research in Australia and New Zealand, which was published in 1992. 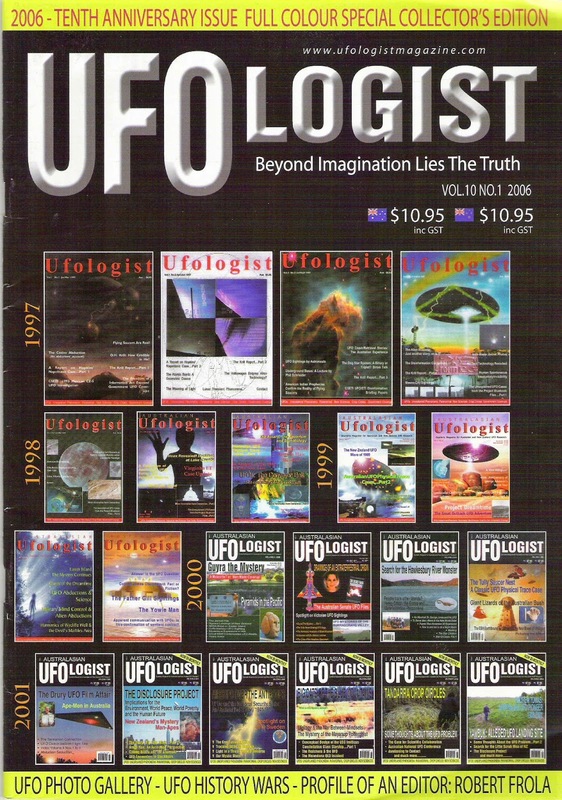 It brought together material published in Vladimir Godic's UFO Research Australia Newsletter (UFORAN) through the eighties, and was a testament of the success of UFORA. Unfortunately Vladimir Godic's untimely death in 1995 led to the closure of UFORA. ACUFOS limped into the nineties a pale shadow of its former self. Most serious researchers had long since abandoned it in favour of the national networking vision established by ACOS and the earlier ACUFOS manifestation and UFORA, and because ACUFOS had lost direction and credibility with what was seen as the uncritical promotion of dubious material by its final incumbent co-ordinator. Its recent attempted resurrection lacked credibility and seemed to be little more than a vehicle for the views of a rather skewed form of ufology. The proliferation of interest in the UFO field seemed well served by the variety of groups, networks, and individuals that became available. Their contributions were supplemented by the influx of new people and approaches. The civilian contribution to elaborating the Australian UFO mystery continued with considerable momentum, but national focuses were difficult to coordinate. However the national vision pioneered by CAPIO, ACOS, ACUFOS and UFORA were to get an effective re-empowerment. In 1998 the Australian UFO Research Network (AUFORN), was formed by Robert Frola and Diane Harrison. AUFORN provided the opportunity for an effective, and yet, informal network through a number of successful steps, including the AUFORN internet network and a national toll free UFO hotline number for reporting sightings. 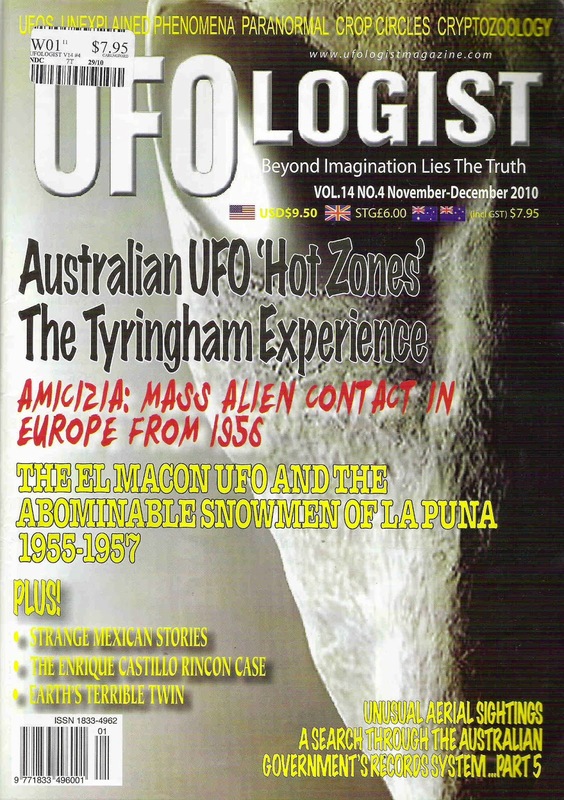 AUFORN also supported the growth of this magazine the Australasian Ufologist which by 1999 had become a national newsstand publication. 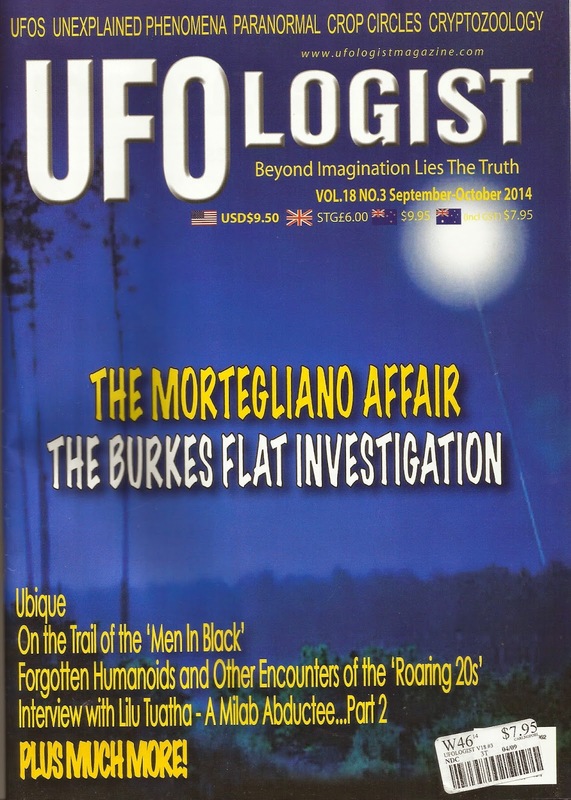 Both AUFORN and the Ufologist continued into the new century and mobilised the national focus that has been consistently revisited since the inception of public civilian group interest way back in 1952. The persistence in pursuing a national research, investigation and publishing vision for the UFO subject is an important and critical part of our ongoing attempts to understand this extraordinary subject. A national spotlight on the UFO phenomenon needs to continue and should be vigorously supported. Commercially published books on UFOs in Australia have appeared over the years with widely varied approaches in detail, focus and style. Australia's first book on UFOs appeared in 1965. "Flying Saucers over Australia" by James Holledge (or Stephen Holledge – the book carries both! ), was a paperback billed as presenting "the startling indisputable evidence of Unidentified Flying Objects operating in our skies". Holledge was a journalist who had churned out a number of books that were heavy on sensation and light on fact. When you see some of his other titles, such as "Inside Soho", "Cult of the bosom", "What makes a call girl", "White slavery" and "Black Magic" then you realise not to expect much. Surprisingly, despite being rather superficial, it did touch on a number of the key cases, including the 1965 Vaucluse Beach landing and the Charles Brew case. Holledge did however take Adamski at face value and seemed sympathetic to some other contactee claims. Australia's second UFO book, "Flying Saucers - Where do they come from?" emerged during 1967. Its author, Sydney Sales Manager and former Royal Air Force photographer, Richard Tambling, had several UFO sightings of his own. While it covered some of the better recent local sightings, it was Tambling's infatuation with contactee photos (particularly those of Dan Fry and Paul Villa) that set the tone and with hindsight revealed his calling. As an Air Force photographer Tambling should have been a bit more critical, but subsequently all pretence was put aside. Tambling was a full blown contactee, his space friends from Uranus no less. A slightly expanded edition of the book, still not mentioning Tambling’s personal contactee journey appeared in 1978. Prolific writer Michael Hervey's book, "UFOs over the Southern Hemisphere" was published in 1969. It was widely publicised and sold well. It was the most detailed compilation of Australian sightings to date, but unfortunately poor editing and research made it a rather uncritical mixture of low weight sightings and good cases. A sightly revised edition was published in 1975 but little had improved. For the period, however it was a handy reference for sightings. John Pinkney and Leonard Ryzman made a short lived splash in 1980 with their book “Alien Honeycomb – the first solid evidence for UFOs.” Not quite – prosaic sources rather than saucers were fitted the bill, but interspersed with the story of the “not so alien honeycomb” was coverage of Australian UFO sightings. 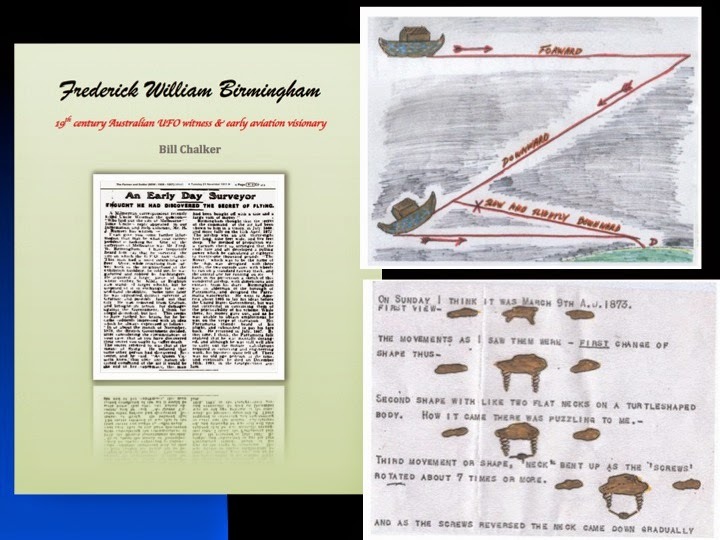 Its focus on the disappearance of pilot Frederick Valentich was overshadowed by Kevin Killey and Gary Lester’s 1980 book “The Devil’s Meridian” which attempted to caste Bass Strait as our local answer to the Bermuda Triangle. Veteran research Stan Seers had his memoir on the Australian UFO scene published in 1982 – “UFOs – The Case for Scientific Myopia”. In the same year journalist Quentin Fogarty attempted to exorcise his Kaikoura UFO “demons” with his book “Let’s Hope They’re Friendly!” – a title that could have referred both to the UFOs and the researchers, media and skeptics that responded to the Kaikoura UFO enigma. Murray Stott published his book “Aliens over Antipodes” in 1984. It covered both Australian and New Zealand UFO events, sprinkled liberally with speculations and thoughts about the UFO subject. Vladimir and Pony Godic edited a digital book on UFO research in Australia and New Zealand, which was published in 1992. It brought together material published in Vladimir Godic's UFO Research Australia Newsletter (UFORAN) through the eighties. My book “The OZ Files – the Australian UFO Story” was released in 1996. It represented a detailed history of the Australian UFO controversy. Kelly Cahill, who was central to the unravelling of an independently witnessed CE3 event with apparent “abduction” dimensions and compelling related physical evidence, had her own book on the first high profile abduction milieu in Australia, also published in 1996. A regional survey, “The Gosford Files – UFOs over the NSW Central Coast” by Moira McGhee & Bryan Dickeson, appeared in 1997.